Tapta Marg is partnering with the International Folk Art Market to bring you a vibrant series of journeys to prime arts destinations around the globe! The Indian states of Gujarat are Rajasthan are known for their varied cultures, vibrant art, village handicrafts, jaw-dropping stone temples, and stately palaces. From the white deserts of Kutch to the bustling markets of Ahmedabad to the phenomenal sun temple at Modhera and the pink palaces of Jaipur, this is India at its most colorful and awe-inspiring. This region is widely known for its artistic traditions — it seems that every village has its own expression of traditional craft, from world-renowned embroidery to block printing to vibrant painting and pottery arts. This depth and diversity of artistic expression is why artists from this region are heavily featured each year at the International Folk Art Market. Join Santa Fe-based tour operators, folk art enthusiasts, and yoga instructors Josh Schrei and Cigall Eacott as we journey into the heart of Gujarat and Rajasthan for twelve days of awe-inspiring travel, folk art immersion, temple and palace hopping, and optional yoga and meditation practice. 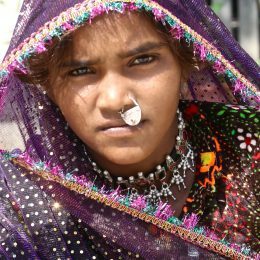 · The local handicrafts, fabrics and tribal arts surrounding Bhuj, including the Qasab-Kutch Craftswomen’s collective, the world-renowned Khatri block printing studio, and the Khatri tie-dye workshop. · The opportunity to study with local artists and try your hand at block printing and embroidery. · The sun temple of Modhera, one of only two sun temples in India. · The markets of Ahmedabad. · Agashiye rooftop restaurant, one of the best restaurants in India! · A safari into the Little Rann wildlife sanctuary, home to unique native flora and fauna. · The pink city of Jaipur with its gorgeous palaces and famed blue pottery. I read this article and found it very interesting, thought it might be something for you. The article is called Adventures in Folk Art and is located at http://taptamarg.com/folkart2018/.